Beth Grossman is a socio-political artist, who sees the visual as a way to create community dialog. Her art is a comfortable point of entry into the ongoing dialog about ‘correct’ history, the life-shaping force of religion and the power of social beliefs. The artist takes creative liberty with these charged topics and makes them accessible with beauty and humor. By shifting the context of familiar objects, words and images, she opens them up for fresh examinations that are by turn playful, stimulating and thought provoking. 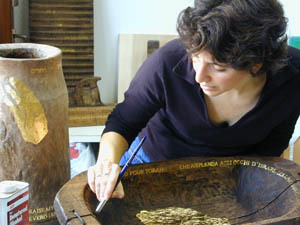 Grossman has exhibited and performed her work at the International NaturKunst Forum: Licherode, Germany, Jewish Women’s Summit: Volga River, Russia; Keepers of the Water: Chengdu, China; the de Young Museum: San Francisco; Minneapolis Institute of Arts; Ellis Island Immigration Museum: New York; National Jewish Museum: Washington, D.C.; the Contemporary Jewish Museum: San Francisco; Minnesota History Center: Saint Paul, MN; Jewish Museum of Florida: Miami; National Museum of American Jewish History: Philadelphia and City Halls and Public Libraries in the San Francisco Bay Area. The public conversations prompted by Grossman’s artwork consistently capture the interest of the mainstream media. This includes coverage by Chinese television and German HR television and German local press. Grossman’s artwork and participatory performances have been widely documented by the press, including feature stories in the Los Angeles Times, New York Times, Miami Herald, New York Newsday, Denver Post, San Francisco Chronicle, Atlanta Journal Constitution, Oakland Tribune, and the San Jose Mercury News, Lilith, Artweek, San Francisco Arts Monthly, National Public Radio’s California Report, and on KRON4television news.